The Hults Bruk American Felling Axe by Dave Canterbury is an American-style, straight-handled axe. Felling large trees the traditional way is an art requiring skill and a proper axe. Understanding the features of a tool, and the tool's intended purpose, are key elements to consider when creating the perfect woodsman's axe. The Hults Bruk American Felling Axe by Dave Canterbury is an American-style, straight-handled axe. Felling large trees the traditional way is an art requiring skill and a proper axe. Understanding the features of a tool, and the tool&apos;s intended purpose, are key elements to consider when creating the perfect woodsman&apos;s axe. 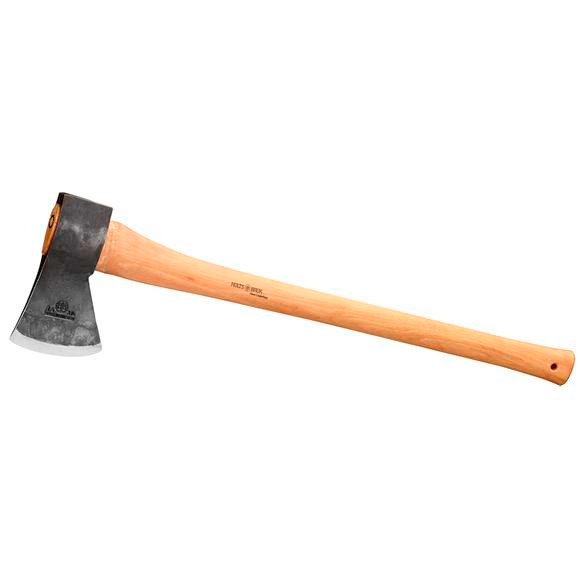 By meticulously pairing the right style of axe head with the right kind of handle, the American Felling Axe drops dense, large sized trees effectively, allowing the user to work longer without tiring. Featuring a straight, 32-inch American hickory handle to reduce wrist pivoting on the swing and a renowned, reliable Montreal pattern axe head. Useful for more than just felling, the pattern features wide cheeks for splitting and a long, razor sharp bit for felling, bucking and processing wood. Overall Length Handle Length: 32"